More than 90 per cent of the Federal infrastructure funding allocated to Victoria in last month’s Budget won’t flow until 2022-23 at the earliest, further proof that the Turnbull Government is determined to short-change and punish Australia’s fastest growing state. Making Victoria wait at least four years for the promised funding means that projects such as completing the duplication of the Princes Highway between Traralgon and Sale, Monash Rail, and the electrification of the rail line from Frankston to Baxter are off on the Never Never. And despite all the pre-Budget hype there was no funding to build the rail line to Melbourne Airport. The 2018 Budget was a triumph of spin over substance. 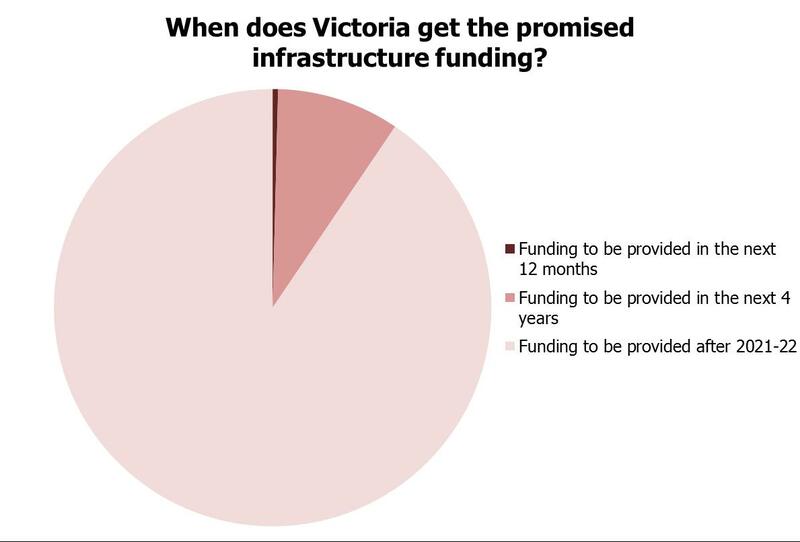 Simply put, Victorians waiting for the extra rail and road funding promised in days leading up to the 2018 Budget will have to re-elect the Coalition not once, but twice more before the bulk of the money flows. Victoria needs investment in job creating, city-shaping and productivity enhancing infrastructure projects now, not years from now. As well as postponing vital investment until years down the track, the Turnbull Government also lacks the ability to translate its past promises into bulldozers on work sites. The fact is the difference between what they promised to invest in the State’s infrastructure over their first four budgets and what was actually spent, amounts to $1.2 billion. Only Labor is committed to delivering the infrastructure Victoria needs. Indeed, the last time we were in office we more than doubled annual Federal investment in the State’s infrastructure from $89 to $201 per Victorian. Across the State we delivered major projects such as Regional Rail Link, the M80 Upgrade, the duplication of the Princes Highway West between Waurn Ponds and Colac, and the Western Highway Upgrade.